This is what DVDs are all about. The after show and backstage footage, interviews with band and crew, tour and fan photos, an inside look at the band's thoughts on touring, creating music, playing music, and living life. As well as oddities and rarities like an electronic press kit, e-cards, lyrics, studio footage, and so much more. WWIII also features live performances from the band, music videos, and archival footage. It's a fully loaded DVD that has everything you could want from a DVD. 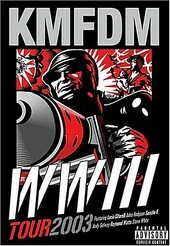 Industrial innovators KMFDM know how to use technology, and know how to get the most out of technology, as they demonstrate on this DVD. Whereas others give you just a live performance, or a few interviews and some behind-the-scenes glimpses, KMFDM dives head first into the creative process and the outcome of the creative process, giving fans a new perspective into the process and lifestyle of a touring band. I'll give this an A-.